What is a Daikon Radish? 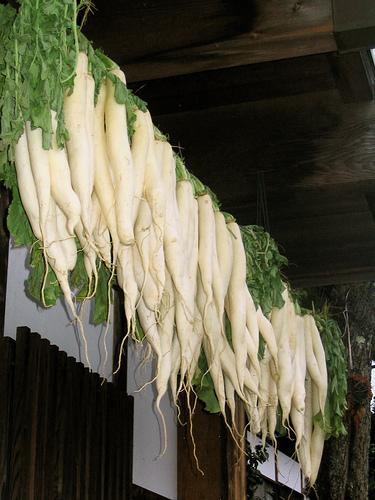 The daikon radish (also known as white radish or mooli) is eaten in oriental cuisine as a digestive aid and also valued for its diuretic, decongestant, and anticarcinogenic properties. Combine the grated radishes and sea salt in a large mixing bowl. Cover and let sit for 20 minutes to release the juices. 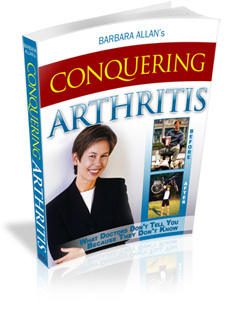 Pack the mixture into wide-mouth quart-size canning jars. Using a spoon, press down until the juices come to the top and cover the radishes. The top of the radishes should be at least one inch below the top of the jar. Once the radishes are packed, fill the pint-size jars with water and seal them. Use these as weights to push gas bubbles out of the fermenting pickled radishes (Insert the smaller jars of water in the open jars of radishes. Push down on the weights once a day and watch the trapped gas bubble to the surface). Depending on the time of year and the climate, the pickled radishes will take between three days to several weeks to ferment. When bubbles are no longer releasing, the fermentation process is complete. Hi. Can you tell me if you cover the bigger jars when the smaller pint size ones are not in them. Thanks. Yes, once the fermentation is completed, I remove the smaller pint sized jars used as weights and then cover the larger jars. May I use red radish instead white ones? Hi Ricardo, Yes, it is fine to use red radishes instead of white one. In fact, that is one of my favorite ways to eat red radishes!